Khandro Tsering Chödrön (Tib. མཁའ་འགྲོ་ཚེ་རིང་ཆོས་སྒྲོན་, Wyl. mkha’ ‘gro tshe ring chos sgron) (1929-2011), the spiritual wife of Jamyang Khyentse Chökyi Lodrö, was universally acknowledged as one of the foremost female practitioners of Tibetan Buddhism of recent times and was considered to be an emanation of Shelkar Dorje Tso. Khandro was born in the Earth Snake year (1929) into the Aduk Lakar family of Kham Trehor, an ancient family of benefactors who supported many monasteries and teachers in Tibet dating back to the time of Je Tsongkhapa. 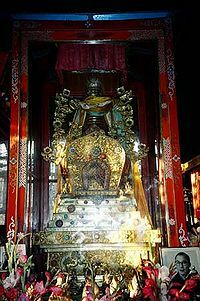 Her mother was Dechen Tso, a princess of Ling, who was married to the two Lakar brothers Tutob Namgyal and Sonam Tobgyal. She became Jamyang Khyentse's spiritual wife in 1948, at a time when he was in poor health and many of his disciples were urging him to take a consort to prolong his life. For the next eleven years she served as his attendant and devoted companion, receiving countless teachings and transmissions, requesting practices and prayers and putting questions to him in the form of songs. According to Dzongsar Ngari Tulku (Tenzin Khedrup Gyatso), on one occasion [c.1952], when Jamyang Khyentse Chökyi Lodrö was opening the sacred place of Khyungchen Paldzong (ཁྱུང་ཆེན་དཔལ་རྫོང་, khyung chen dpal rdzong), known locally as Gyalgen Khyungtak (རྒྱ་རྒན་ཁྱུང་ལྟག་, rgya rgan khyung ltag), above Dzongsar Monastery, Jamyang Khyentse, Gyarong Khandro, Khandro Tsering Chödrön and Sogyal Rinpoche all left their handprints in the solid rock. Together with her elder sister, Tsering Wangmo whose husband Tsewang Paljor was Jamyang Khyentse's private secretary, the young Sogyal Rinpoche, Lama Chokden and a small party of family and attendants, she accompanied Jamyang Khyentse to Central Tibet in 1955, during which time her tutor Lama Tseten passed away near Yamdrok Tso. From Central Tibet the party went to India and to Sikkim, making their residence at the temple of the Royal Palace in Gangtok. Khandro continued to live there for many years after Jamyang Khyentse passed away in 1959, quietly devoting her life to constant prayer in the presence of his reliquary stupa. During this time she read the entire Kangyur and Tengyur. She travelled from Sikkim to Europe and America several times (see dates and places below) at the request of her nephew Sogyal Rinpoche. On 5th of December 2006, near the beginning of Rigpa's first three-year retreat, Khandro Tsering Chödrön took residence in Lerab Ling. Khandro Tsering Chödrön passed away on the 24th day of the 3rd lunar month (26th May 2011) in Lerab Ling. Sogyal Rinpoche and Orgyen Tobgyal Rinpoche were both present at the moment of her passing where she showed all the signs of attaining the final accomplishment of a great Dzogchen practitioner. Dilgo Khyentse Rinpoche, Brilliant Moon: An Autobiography of Dilgo Khyentse Rinpoche (Boston & London: Shambhala, 2008), pages 128, 138. Sogyal Rinpoche, The Tibetan Book of Living and Dying, pages 143-144. This page was last edited on 14 March 2019, at 20:34.